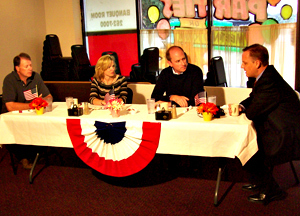 Early this morning the Romney campaign hosted a small-group conversation about last night’s debate at the Home Plate Diner across the street from the state fairgrounds. Former Iowa Republican Party chairman Matt Strawn, who suggested Mitt Romney hit a home run with his debate performance. “For those few remaining undecided Iowans, and there are still a few out there, I think we saw what we needed to see to for those Iowans to be comfortable for those Iowans to be comfortable making that change from Barack Obama to Mitt Romney in just 30 days,” Strawn said. Mark Rogers owns a group of sports bars in the Des Moines area and he was part of this morning’s conversation. Rogers supports Romney because of Romney’s business background. “A person that’s actually been in business before and knows how it works rather than lawyers who worked their way up through the system — the political system — to become a representative, a governor, someday maybe a senator and, of course, president — these people do not understand the stresses and the worries and the risks that small businesses take,” Rogers said. A lawyer from Windsor Heights who is a state representative and a doctor who’s married to a Republican candidate for the legislature also participated in the breakfast table discussion. Early this afternoon, Vice President Joe Biden will visit Council Bluffs and he’s likely to deliver his assessment of last night’s debate. The president of the Planned Parenthood Action Fund is in Des Moines, making appearances on behalf of Obama’s campaign today as well. A Republican source says Romney will return to Iowa next Tuesday, the 9th, to campaign, but the city and site have not been announced.